Integrated planning and reporting is an organisational framework used to identify our priorities that drive the Shire’s operations. The framework consists of number of strategic plans for identifying and prioritising local issues. The Integrated Planning and Reporting Framework (IPRF) ensures Council decisions look to the long-term future and consider the community’s aspirations to deliver the best results possible with the resources available. The framework is also designed to have a stronger focus on place shaping and wellbeing while requiring a greater level of community engagement. The IPRF requires the Shire to have three levels of integrated strategic planning, informed and supported by appropriate resourcing and asset management plans. The framework consists of a number of strategic plans for identifying and prioritising local issues. The strategic plans set the goals and direction for the Shire's future activities. It integrates asset, service and financial plans so that the Shire’s resource capabilities match community needs. The most important of these is the Strategic Community Plan. Supporting strategies including a Long Term Financial Plan, Asset Management Plan and Workforce Plan. 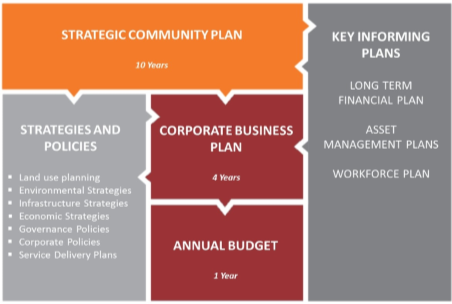 Strategic Community Plan - The Strategic Community Plan is the highest level planning document in the Integrated Planning and Reporting Framework. This Plan is designed to be a ‘living’ document that guides the development of the Shire over the next ten years. Corporate Business Plan - The Corporate Business Plan is the operational plan that maps the Shire’s key priorities, projects, services and actions over the next four years. It provides the detailed actions for the first years of the Strategic Community Plan as well as detailing business as usual service delivery. Annual Budget - The Annual Budget is a detailed financial plan for each year, covering all aspects of the Shire’s operations and reflects the resources generated (revenue) and those consumed (expenditure). Year 1 of the Corporate Business Plan and the Long Term Financial Plan establishes the basis for the Annual Budget. Inclusivity - We recognise the diversity of our community and want to ensure that everyone can actively participate in community life. Unity - We will work collaboratively with the community, united in a common purpose. Sustainability - Ensure that the aspirations of the community can be met within budget in order to remain socially, environmentally and financially sustainable. Responsibility for our own future - We will actively participate in providing input to decision making at a state and national level on issues that affect our region. Leadership - We will listen to the community’s concerns and advocate for issues that are important to residents. Effective - Council will ensure that all work is undertaken in a cost effective manner providing value-for money to the community. We will have a focus on quality in the delivery of all services and programs. Our internal systems will be efficient and will focus on enabling effective delivery. Sustainable - Council will operate within its means, developing budgets that are affordable by the community. Responsive - We recognise that the community is our customer. We will operate with a strong customer service focus in all our work. We will enable the community to provide feedback on our activities and we will respond to our stakeholders concerns in a timely manner. Transparent - We will report regularly to the community on progress against this plan. The Strategic Community identifies four main focus areas for the next ten years and the goals that the Shire will work towards to achieve the Shire’s Vision. Improving liveability through social and recreational opportunities, a range of inclusive community services and activities, and valuing our diversity. We value our Kimberley lifestyle and natural environment. We will work to improve the liveability of our towns and their connection to our surrounding environment. For the Shire to be open for business with a growing and successful economy and jobs for all. We will deliver services to the community efficiently, provide leadership and governance that is future thinking, transparent and accountable. To ensure that the Shire is mains a balance between aspirations and affordability Council have developed a set of decision-making criteria. These criteria show what Council takes into account when considering significant issues. They reflect our values and the decision-making approach applied to developing the Shire’s plans and will continue to be applied as it is implemented. How well does it fit our Strategic Direction? Does the option help to achieve our vision and goals? How are the benefits distributed across the community? How well does the option fit within our long term financial plan? What do we need to do to manage the costs over the lifecycle of the asset / project / service? Does the community support it? How well informed is the community about the costs and benefits of the option? What is the level of community support? Is the community united or divided? What is the evidence? Does it involve an acceptable level of risk? What level of risk is associated with the option? How can it be managed? Does the residual risk fit within our risk tolerance level? We recognise that the Shire is able to make better informed decisions when it engages with the community. the Community Strategic Plan is a living document and we welcome and encourage your feedback and input into the plan.